Like many old European cities, Zagreb has its underground secrets. One of them is tunnel Grič. After years of being closed for the public, I was thrilled when in 2016 they opened the doors again for all to visit. The tunnel was built during the Second World War, but now it has found a new, artistic purpose. On a hot summer day, I like to cool down walking through it and trying to guess which part of town is above me. 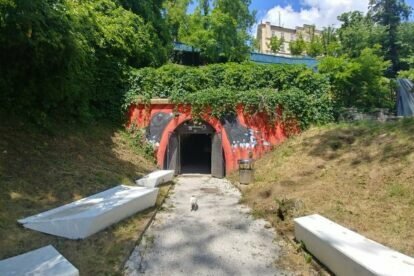 But tunnel Grič is at its best in December, when it becomes a part of Zagreb Advent, as well as on days when it serves as an exhibition area for different occasions and artists. During December and through the beginning of January, the best part about entering the tunnel is the feeling of entering a different world. Magic scenery and lights make the passages come alive and I never miss the holiday season without making some great shots here. There are three points of exit and the tunnel itself is only 350 meters long, so it’s easy to orient yourself and find a way out. It’s not too narrow either, from 3.20 to 5.50 meters at some points. I am not a fan of small and narrow spaces, but here I do not feel uncomfortable. I’m only curious to imagine what else lies under this old city.